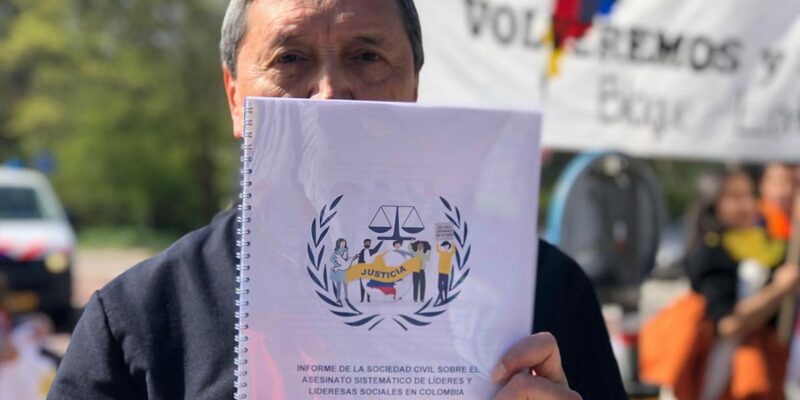 Human rights defenders from Colombia and Europe formally asked the International Criminal Court (ICC) to investigate the ongoing killing of social leaders in the South American country on Friday. Social leaders, accompanied by opposition politicians, delivered the report to the ICC in The Hague, the Netherlands, in which they formally asked the court to open investigations into the systematic murders and who is behind them. Local police said some 500 people from across Europe showed up at the ICC headquarters. According to the organizations, Colombia’s failure to adequately investigate and try those behind the assassinations allows for international intervention. The Colombian state is not itself competent to investigate the killings themselves, due to conflicts of interests, illegal elements active within state institutions, and a “clear lack of political will,” according to the report handed to the ICC. The killings are not stopping, and it is the moment to ask the ICC to turn their eyes to Colombia. We need the support of the international community so that these crimes do not stay in impunity. Though statistics vary, all show peaks around the time of election campaign and an escalation of violence targeting social leaders after peace was signed with now-demobilized rebel group FARC in 2016. The Colombian State does not prioritize the fulfillment of the peace accords, much less the protection of the lives of social leaders. The report analyses data from a number of sources, and reveals systematic, regular, and methodical patterns in the killing of social leaders across the country. These killings “conform to an organized set of rules” despite being carried out by a huge range of actors: paramilitary, guerrilla, dissident FARC, criminal groups, and even the army and State itself. The majority of leaders killed are involved in local work relating to land for groups with an ethnic or identity focus, e.g. rural farmer or indigenous rights. In fact, 80% of murdered leaders were involved in the struggles for land, territory, or natural resources. 18% were in relation to illegal crops. Some 44% of the victims were assassinated in their own homes, the report highlighted. Where are leaders being killed? Land inequality e.g. in Choco, more than 95% of the land is owned by less than 1% of the population. Colombia’s Government: complacent or complicit? There is evidence that the state itself is involved in some of these murders, according to the report as some of the killings were carried out by members of the security forces. The social movement in Colombia is being directly attacked by state agents, as we are seeing at the indigenous protests this month. According to the report, the government’s national protection mechanism has been ineffective, but much more significant is the failure to fulfill the peace process. Whether the ICC will open a formal investigation into the killings depends on the court, which first will have to define if the government in fact is either unable or unwilling to prosecute the crimes against humanity.